Boulevard comes with predefined categories in Expenses, all of which can be modified or removed except for Bank Charges and Postage/Freight. 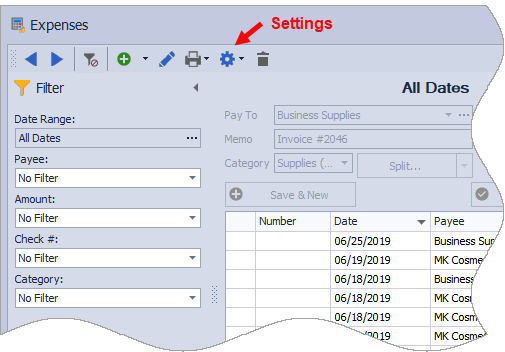 Boulevard automatically creates expense entries in those categories when credit card charges are processed in Credit Receivables, or a product order is received into inventory. Additional categories can be added based on the needs of your business. Please Note: Main Street cannot give tax advice, only general suggestions. Please seek the advice from your tax professional on how to handle individual expenses and income. From the expense toolbar, click Settings and from the drop-down options listed, select Categories. To add a category, scroll to the bottom of the list, and using a new row, fill in all applicable fields. When finished, click OK to accept and close the form. From the expense toolbar, click Settings and from the drop down options, select Payees. To add a payee scroll to the bottom of the list, and using a new row, fill in all applicable fields. Please Note: The Bank Charges and Postage categories cannot be deleted as they are used by Boulevard internally for recording ProPay fees and shipping charges associated with product orders.